Halloween is being celebrated all over the world today and, since we’re a technology blog, we thought we’d cover some of the more cooler uses of the latest and greatest gadgets in celebrating said event. We showed you a video involving magic tricks performed with an iPad 2 and today, we’ll be talking about a very neat use of the iPad 2 for a Halloween costume. The discovery comes from the folks over at Gizmodo – a popular technology blog – in a post where they discuss the costume, how it works and the person behind it. 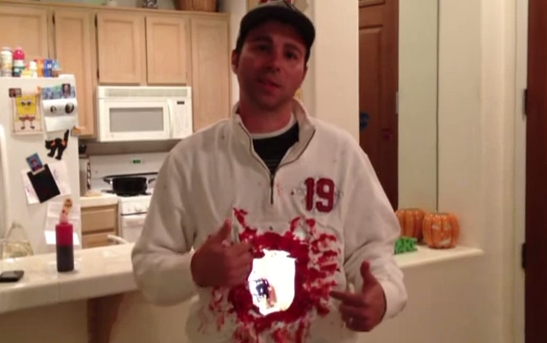 The Halloween costume was made by Mark Rober – a mechanical engineer at NASA’s Jet Propulsion Lab. It uses FaceTime cameras of two iPad 2s to create the effect that Rober’s body has a big gaping hole in it. A very smart dude by the name of Mark Rober figured out that if you strap two iPad 2’s to yourself, you can create this incredible, freaky hole effect. This guy should work for NASA. Oh wait, he does. Recreating his costume isn’t all that difficult. You basically need two iPad 2s, fake blood, a WiFi (or 3G) connection and a shirt with two holes in it. Rober cut two holes in his shirt – one on the front and the other on the back, applied some fake blood around said holes and put an iPad 2 in each hole. He then started a FaceTime video chat between the iPads so that the front iPad’s screen would show whatever is behind Rober and, the rear iPad would, well, show whatever is in front of him. This creates a very interesting gaping hole effect and is sure to attract attention from females who may then wish to slide to unlock your iPad, if you know what I mean. So yes, while it seems quite easy to set up, it is quite expensive: worth at least a thousand dollars. Also, for those of you wondering why the iPads aren’t aligned: it’s because the front iPad’s camera is placed such that it is exactly in the middle of the rear iPad’s screen.